Global warming receives a great deal of public attention these days, but it is likely that most folks think of the issue in the simplest terms: rising sea levels, stranded polar bears, and squabbling politicians. Bradley J. Dibble hopes to entice more people to dig deeper into the subject with his thoroughly approachable new book, Comprehending the Climate Crisis: Everything You Need to Know About Global Warming and How to Stop It. The author is a Canadian cardiologist who has been actively involved in environmental issues as a concerned citizen. A frequent public speaker on climate change, he has served on the Canadian government’s Sustainable Development Advisory Council. Dibble does an admirable job of explaining complicated topics across a wide range of scientific disciplines. He writes clearly and well, introducing the reader to the complexities of the Earth’s carbon cycle, the molecular mechanics of why certain elements interact with each other, and how a series of man-made actions have increased levels of greenhouse gases to an alarming level. He describes the increasing intensity of severe weather, energy dependency on a rapidly diminishing supply of fossil fuels, deforestation, water shortages, and even the spread of tropical illnesses and parasites. A dash of humor laced throughout the book keeps the reader engaged in what could otherwise be a daunting topic, both in terms of the scope and complexity of the issues involved. The author gets kudos for not just describing climate change, but offering a number of small and large ways citizens can help tackle some of the problems. Aside from its New Age-inspired cover art, the book is well designed. The author provides a review of key concepts and a suggested reading list at the end of each chapter for readers who want to take this introductory lesson further. There is a good balance of text and easily understood graphics, and the helpful glossary and index add another layer of usefulness to this volume. 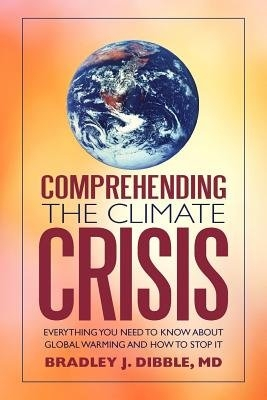 Comprehending the Climate Crisis is recommended for anyone with an interest in the environment, and particularly for those who may not have more than a general background in science. It could easily be used as a high school or college-level textbook. Dibble has written a balanced analysis of global-warming issues. He offers many courses of action to address climate-related problems, and he does so without harangue or shrillness.